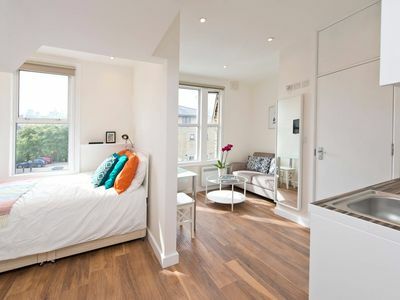 A sleek studio flat in Central London. Super central with great transport links into and around London! The studio is fully fitted with private bathroom and kitchen area and can sleep up to 3 people. You will be hosted by a luxury hospitality service during your stay. This flat would suit business travellers and tourists alike. I hope you can enjoy a long and comfortable stay here! My apartment is a charming and functional space. Clean lines, and sharp, modern decor define the space, creating a metropolitan vibe. A partitioned alcove separates the double bed from the living space, giving you privacy and comfort. The bed will fit two adults comfortably, and will be spotlessly made up with hotel quality linen, in advance of your stay. There is also ample storage space for your clothes and belongings. The open-plan kitchen and living space provides you with everything you would need for a comfortable stay. In the kitchen there is an oven, electric hob, and refrigerator with freezer drawer. You are welcome to use any of our kitchen utensils to prepare meals. There is also a modern dining table that seats two people. However, if you would rather have meals prepared for you, there are great places to eat, or take-away services that will bring gourmet to you! The lounge area is a great place to relax after a long day. A comfortable love seat faces the minimalist glass coffee table, where you can work on a laptop, or watch the TV. The sofa also turns into a sofa bed for one person if requested. There is a convenient bathroom, with a walk-in shower, a toilet and basin. All guests will be provided with complimentary towels and toiletries. I have also arranged for a hospitality company to offer you concierge services (restaurant reservations, tickets, extra cleans during your stay) at an extra cost, if you so desire. This is the perfect place to stay for business travellers, or couples, looking for a convenient base to feel like a local in London! Guests have complete access to the apartment, Additionally I’ve arranged for a concierge service to be available to you throughout your stay, providing you with free on-demand support for booking restaurants, tickets to shows, transport…or anything else you might fancy! I hope that this will help you get even more out of your stay. Full details will be provided at check-in. I have engaged a professional hospitality company to look after you during your stay. They are on call to attend to your every need. Situated in the exciting Shepherds Bush area, this flat has great local amenities. Westfield shopping centre is in walking distance, offering luxury goods and high street shops. The BBC studios are nearby. For evening entertainment, you are close to the music venue Shepherds Bush Empire, and comedy venue Hammersmith Apollo. There are great local pubs and bars, my favourite is Brewdog on Goldhawk Road, and to eat Vine Leaves Taverna for a reasonably prices Greek dinner. You can access almost all of London from these stations! Please note that standard check in times are between 3pm - 10pm, but subject to availability. Please note that by booking you understand that your preferred check in time may not be available but will always try to be accommodated!